Glass beads handcrafted in a flame and annealed in a kiln. Ever-evolving bead designs. On their own, as sets or as part of individually designed pieces of jewellery, beads are both tactile and visibly striking. 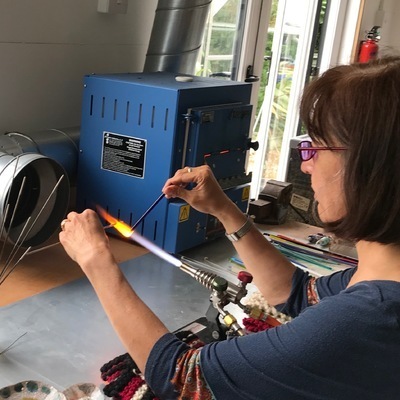 New for 2018 - Glass Bead Making Workshops! I have been making glass beads in my garden studio since 2005. Earlier I had dabbled with silver work and making jewellery using ready made beads I had purchased on bead shop websites. Unfortunately the beads that arrived were often disappointing. In my search for beads I found myself at a bead fair, where tucked up in a corner was a demonstration of glass bead making, it was mesmerising. I decided I just had to do it! It wasn’t as easy as it looked initially, but with patience and practise I developed a few basic techniques. From then I have not looked back. A combination of learning more advanced techniques on various courses and experimenting on my own has enabled me to develop my own unique style. I create my beads by designing a set for a particular piece of jewellery or jewellery collection, When developing new ideas, I like to go with the flow and try all sorts of shapes, colours and technique combinations and see what comes out, with some surprising and unusual results. I have a passion for making beads and especially enjoy the process of manipulating and controlling glass in a flame. I love colour, so glass is a perfect medium for me as the possibilities are endless. Everywhere I go I look for ideas for different colour and pattern combinations. When I am not at work on my beads, I may be knitting wire jewellery, walking my dog or gardening. I have enjoyed being an Open Studio participant since the Summer of 2007. 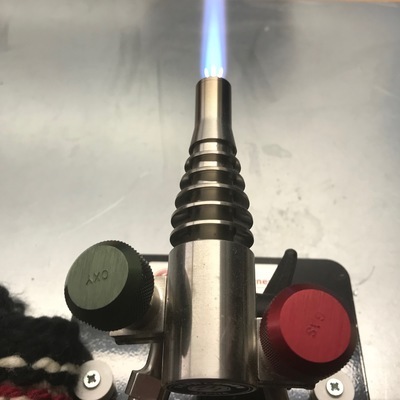 This year I am again looking forward to demonstrating how I make a bead, from a glass rod to reamed finished bead. In the past I have had stalls at local craft shows. My jewellery can also be found at several island shops including the Quay Arts.. I can also offer bead parties, where small groups of people can design and make their own jewellery using my glass beads. Brand new for 2018! 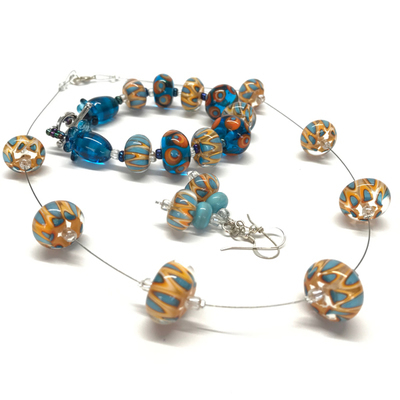 - A workshop where up to three people at a time can enjoy dabbling in glass bead making! Visit my Open Studio (13th, 14th, 15th, 20th, 21st and 22nd July 2018) or contact me by email - annahaywardglassbeads@gmail.com. In 2011 I won first prize in the strung jewellery category of the GBUK [Glass beadmakers UK] competition and runner up in the mixed media category 2012.